I received my granddaughters baptismal gown on a timely basis, and all was so perfect - the gown, slip, bonnet, booties and bib - even the packaging was of quality! Thank you for providing this quality, professional service with a personal touch. Many times marketing presentation doesn't deliver the consumer with their expectation - but Marianne, you have delivered. I truly was surprised that I experienced the privilege to speak with you, designer of the gown, who was so sincere, and willing to please. My pleasure has been communicating with you, and your product was all that I believed it would be. Your designs are beautiful! Undoubtedly, your customization met my expectations. Please know that compliments and inquires flow as a result of your designs. God bless you for being real and providing beautiful designs with remarkable quality. 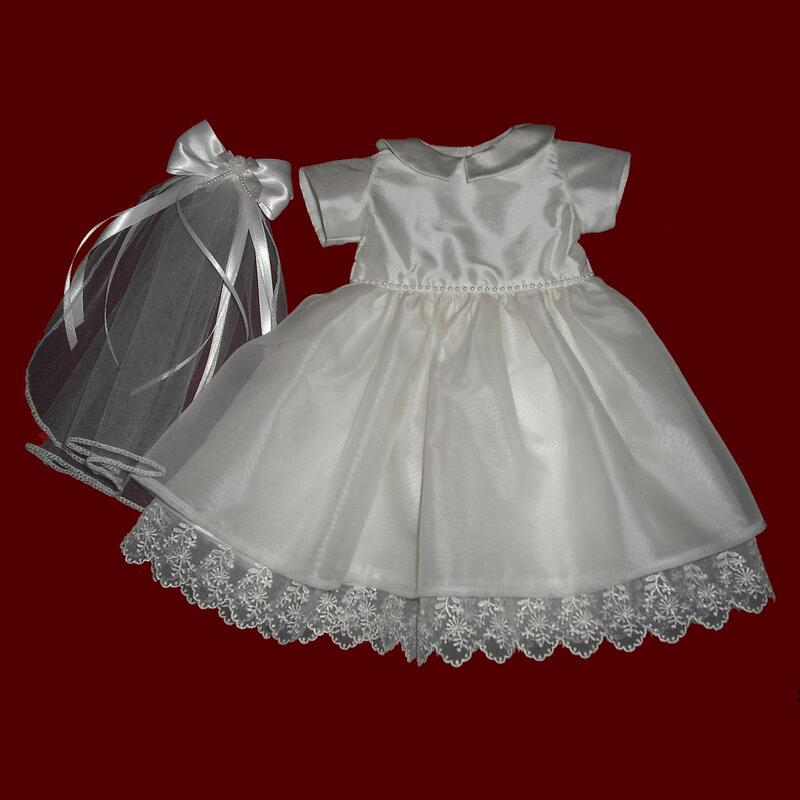 White silk organza over silk dupione communion dress with scalloped embroidered organza lace & hairbow with veil designed to fit the American Girl doll or other doll of your choice. Available sleeveless, cap sleeve (shown), short puffy sleeve, sheer short puffy sleeve, 3/4 length or long sleeve with or without collar. Waistband with pearls & back bow which closes with Velcro. State custom doll size under special requests below. Irish accents available.